If you’re researching product label printing then you’ll come across two print types – flexographic (or flexo) printing or digital printing. Digital printing is a newer version which has a number of benefits. Here is a guideline of when it’s best to choose digital label printing. It’s important to keep your product design fresh to attract new customers, which is why organisations often need to be able to change their labels. With digital printing, this is a real option because it doesn’t involve changing plates as with flexo. The technology for digital printing ensures all the labels are consistent in quality and size. This continuity in product labelling can be very important for consumers who will consider the quality of the product inside mirrored by the labelling on the outside. Because there are no costs related to setting plates, digital printing can be the more affordable option. This is particularly important when it comes to label changes or trial designs. Variable data is essentially product information that is unique, often found in limited offers or promotional material. This can include best before dates, batch numbers, tracking details, QR codes, sequential numbering or personalised information. With the lack of plate changes needed, digital printing makes for the best option. 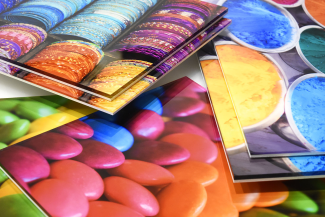 With digital printing, there is not necessarily a minimum order quantity which is ideal for customers looking to test a design for a period of time, or those looking to launch multiple designs for varying target markets. The other associated benefit is that you won’t need storage space for all your stock which could potentially become outdated. If you’ve just developed a new product but aren’t quite sure which label will hit the right market, then digital printing will allow you to try out various prototypes without excessive costs. Because of the limited setup time required – with no plates to make – digital printing is a lot quicker so customers can expect a fast turnaround time which is always better for business. With digital printing, there is minimal ‘dot gain’ which means that, it you print a tiny dot, it will remain that size. Unlike with flexo and its ink transfers, the end result of digital printing is a lot cleaner. So if you’re looking for high quality, fine line imagery, then digital is the best bet. When it comes to cost, flexo is cheaper for bigger quantities with the cost of plate setup being incurred the more prints are made. Digital printing is the better option for smaller scale print orders.